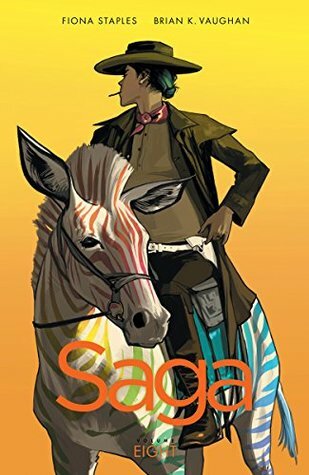 Image Description: The book-cover of Saga – Volume Eight by Brian K. Vaughan and Fiona Staples. The cover features main character Alana (in a Western cowboy type of outfit) riding a Zebra-like creature, the exception is that this type of Zebra has rainbow coloured stripes instead of the usual black stripes. Trigger Warning and Content Warning: This graphic novel series contains the following topics: Civil War, Death, Grief, graphic depictions of Combat, Deaths of Soldiers during a Civil War, Deaths of Civilians during a Civil War, Post Traumatic Stress Disorder, Drug Use, Drug Use in conjunction with PTSD, death of a child, and abortions. After the events of Volume 7, Alana and Marko must find a way of medically removing their dead child from inside Alana, unfortunately, because of their outlaw status and various bounty hunters, this proves to be a bit of a challenge. Eventually, Sir Robot comes up with a solution, they take the space-tree to Abortion-town, and no, I am not kidding, that’s what it’s called. Image Description: In the background of the image is a western-style image of a town, in the foreground of the image is a humanoid-shaped Owl, wearing a doctor’s lab-coat, a Stetson hat, a sheriff’s star badge, and pink boots. 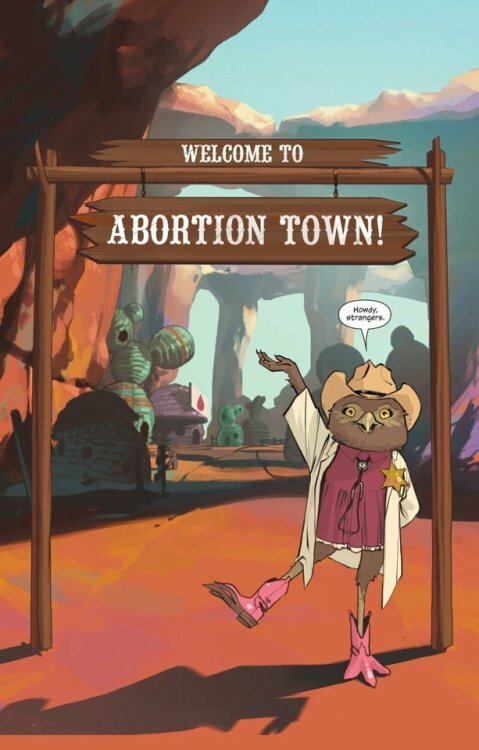 The owl-doctor is standing in front of a wooden sign that displays “Welcome to Abortion Town” and there’s a small speech bubble saying, “Howdy, strangers”. The staff of Abortion Town can’t help Alana due to the fact that they can’t perform late-term abortions for any reason (this is due to Landfall Government rules and regulations). Alana predicted that Sir Robot’s plan wouldn’t work. Instead, she obtains the location of a “questionable” doctor who might be able to perform the operation that Alana requires. Alana then proceeds to banish Sir Robot and leaves him at the entrance of Abortion Town. I’m going to honest, I wasn’t expecting Alana to do that, I was expecting a scene I had already seen a hundred times before. I was expecting Alana and Sir Robot to talk and to attempt to resolve the emotional tension between them. Sir Robot would make an apology and Alana would accept it. Everyone would move on and pretend the event had never happened. But that’s not what happened. I’m super glad that the writer and the artist managed to subvert my expectations. Alana doesn’t lie to him, she doesn’t say that it isn’t his fault (although I do feel that Sir Robot is not entirely to blame either), she just walks away. I know this will sound harsh, but it’s super refreshing to see Alana walk away from him in silence. Alana is very clearly saying to Sir Robot, “Your emotions aren’t my problem, they are yours, you deal with it.”, it’s a short scene but it speaks volumes. While the Saga series definitely does have a Stuffed in The Fridge problem (more on that later), Alana’s character really does shine in this volume. 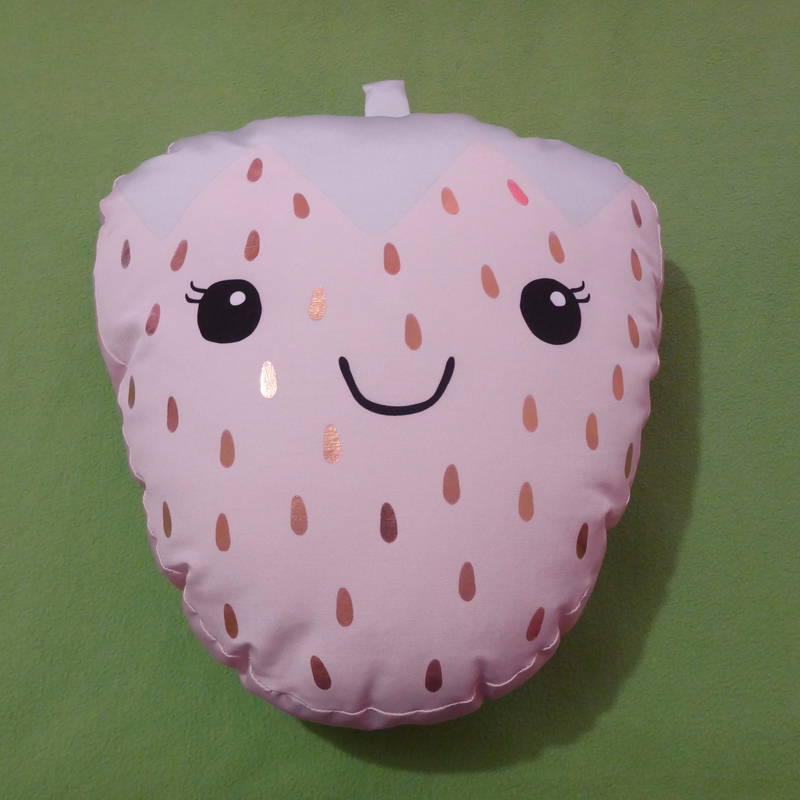 Alana is dealing with such a heavy situation, but it doesn’t stop her, she just picks herself up and keeps going. Alana is a character that, thus far, has demonstrated “typically” masculine traits, such as impulsiveness, aggression, and a tendency to trash-talk. There’s nothing wrong with these character traits in a female character, however, in volume 7 and 8, the reader gets to see Alana’s motherly aspects as well. Soft is not weak and Mama Bear characters come in many different forms. Image Description: an image of Sir Robot (a humanoid alien with pale-blue skin and a television for a head) forming his hand into a cannon facing the viewer and his right hand holding up a paperback novel. There’s a dialogue bubble above his head that says, “I just stopped by to return a few things”. Here’s the thing, while I still think the narrative elements of conflict are a little forced, I don’t mind how the artist and the writer handled the fall-out and the narrative consequences of Sir Robot’s actions in Volume 7. I understand why Alana is taking the “banishment and silent treatment” approach to dealing with Sir Robot. Sir Robot knows, deep down, that he isn’t in love with Alana, Sir Robot is in love with the idea of Alana. Sir Robot is a lonely person attaching himself to people who have shown him kindness, which means that this is Sir Robot’s emotional baggage to handle. So, how does Sir Robot deal with this situation? By helping to rescue Petrichor from her death-seeker behaviour and then the two of them get completely wasted. Honestly? This makes sense and is completely in character. I suspect Marko and Alana have been rubbing off on Sir Robot and, while I don’t think he’s quite ready to admit it just yet, I think he enjoys playing the hero and rescuing damsels in distress (although Petrichor would probably despise being referenced as such). I loved reading about Squire’s side-quest, Squire has only received a few panels so far in the series, and I’m super excited about what the writer and the artist have planned for him. I liked watching the conflict between Squire’s priorities as well. I think this is a good hint towards interesting character development. I also enjoyed watching Squire interact with Ghus as well. The big REUNITED scene with Sir Robot and Squire was everything I could have hoped for, those two are so freaking adorable together, I love them together! No more separation! I love Petrichor as an addition to the Saga crew, I find Petrichor super relatable, and I was super intrigued when in this volume the reader is able to find out a little more about Petrichor’s backstory. I really enjoyed the bonding-scene between Petrichor and Hazel where they’re talking about body issues, it was a conversation that needed to happen, but I think the conversation was handled well on both sides. I feel as though the reader is only just starting to get to know Petrichor, which is why her bonding moment with Sir Robot was an interesting development, it was intriguing and surprising to know that the two of them have a lot of common interests. It was a nice moment, but I honestly don’t see the writer and artist continuing with it, while I have a big fondness for both Petrichor and Sir Robot, I just don’t see the situation working long-term. If I have one quibble, it would that I would have liked to have seen the conversation between Petrichor and Alana, the conversation where Petrichor convinces Alana that Sir Robot should be let back on the space-tree and then take him home. Yes, The Will is still alive, and I honestly have no idea why (and not in a good way). I don’t know what to say at this point that I haven’t already said. As interesting as it is to learn about The Will’s and The Brand’s traumatic childhood, The Stalk and The Brand have now featured in more comic-pannels as dead-characters than as featured in comic-pannels as alive-characters. The Stalk and The Brand were interesting characters and they deserve better than to be used as a plot-device for someone’s character development. The situation with The Will is plausible in the way I understand the narrative process behind it. With regards to “The Diplomat”, the person who captures The Will, I understand why she does what she does, this could even have been an interesting plot development. The problem is that I’ve already seen this type of thing a hundred times before. The Diplomat isn’t believable as a character. She’s trying so hard to be “EVIL” it just demonstrates how pathetic and unbelievable she is. I’m going out on a limb here, and I’m going with the thought process that this is intentional. Although I will admit that I found her great identity reveal was stupendously anti-climatic, I laughed so hard when her mask came off and The Will just gives her this blank look. I liked the conclusion and character development of this volume, I understand that in the Saga Universe, there is very little closure, but this volume gave a little. I look forward to Volume Nine. I’m just itching to get my hands on the next issue.